Miami Public Adjusters Commercial & Residential Insurance Claim Adjuster in Florida. Settle your home or business insurance claims with a professional Miami public adjuster on your side! Living in Miami & Have an Insurance Claim? Get all the money you deserve, even if you’ve already been paid from your claim. Obtain a FREE consultation and inspection with no obligation. Attention Miami Florida Residents! All Lines Public adjusters represents you not the insurance company. 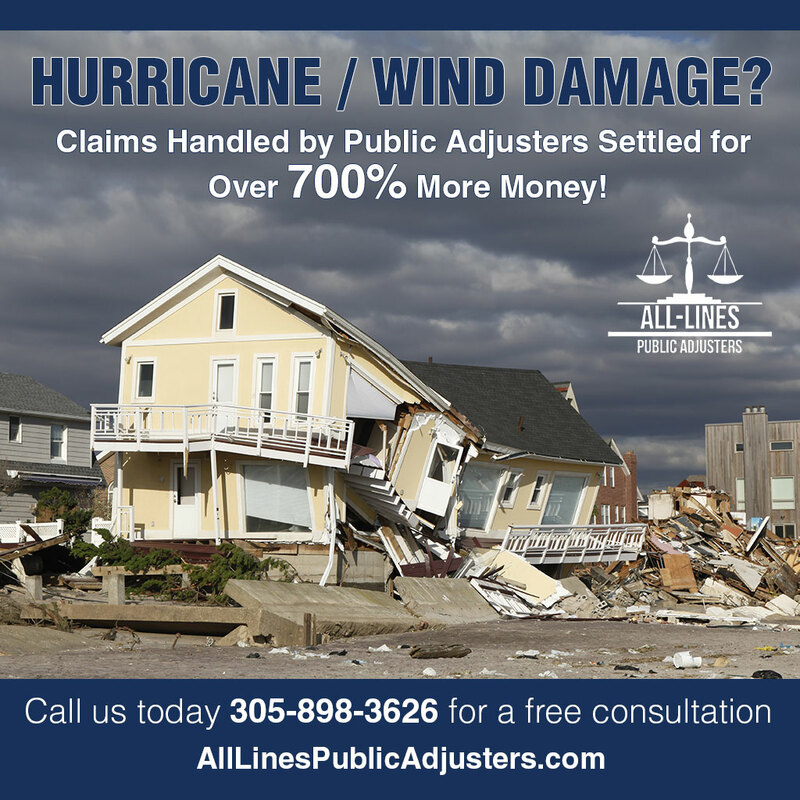 All-Lines Public Adjusters is an owned & operated public adjusting company in Miami, FL since 2009. Our Company will meet with you and evaluate policy coverage and damage. We will initiate your claim, estimate the damages to your Miami home or business & negotiate with your insurance company to maximize claim payment. We handle all residential & commercial insurance claims, specializing in plumbing, sanitary line claims, hurricane wind damage, windstorm damage, flood & other events or claims in the Miami area. Call our Miami public adjuster specialists at 305-898-3626 for a FREE consultation today. Servicing the Miami, Florida area & all of Dade County. Is your home or business a victim to a natural disaster, property damage, broken pipes, or theft? Starting an insurance claim with All-Lines Adjusters will move you in the right direction to ensure that you get compensation for your loss. Do you Have a Hurricane Damage Insurance Claim or Wind Damage Claim? In the Last 5 Years, Did you have a Hurricane Damage Claim that Settled for much less than you deserved? A Study done by the Office of Program Policy & Government Accountability Showed that Hurricane Claims handled by Public Adjusters Settled for over 700% (747 percent) More Money than those handled by the Policy Holder directly! Our Licensed Public Adjusters are Experts at Hurricane Damage Insurance Claim Recovery. If you lived in Miami, Florida, between June 1 – November 30, the threat of experiencing a hurricane is very real. Hurricanes are usually associated with damage on a potentially huge scale especially in the South Miami Area. Hurricane damage to your home or business can result from intense wind, flooding, debris, and massive amounts of rain that hurricanes deliver. When faced with hurricane damage, the last thing most people want is the added stress associated with filing an insurance claim and having to negotiate an insurance settlement. Let our professional Miami Public Adjusters at ALL– LINES Public Adjusters located in Miami, FL provide you with peace of mind. Let us take care of your insurance claim recovery. When you are faced with hurricane or storm damage, before you call your insurance company, call our expert team of licensed public adjusters. We are the specialist in hurricane damage assessment & recovery for Miami residents and businesses. We work for you, as your insurance claim advocate, to make sure your insurance company pays you for every bit of loss associated with your hurricane damage claim. We are public adjuster experts in assessing all hurricane windstorm damages and providing insurance companies with the real proof & documentation they require to pay top dollar on your hurricane claim. Your insurance company has professional adjusters that look out for their best interest; so should you. 1. Thousands of dollars in hurricane damage is often missed when your insurance company is left to assess damages and pay you for those damages. Our team knows exactly where to find hidden damages often associated with hurricanes. Let us assess your claim for free; and go after your insurance company for every cent they owe you. 3. If you lost personal or business revenue as a result of hurricane damage (or any other kind of insurance property damage), you could be entitled to recover lost revenues, temporary moving expenses & more. With a thorough, FREE insurance claim analysis, we will take advantage of every provision in your policy to get you every penny you are entitled to. Call our Miami office today for review of your Insurance Policy and assessment of Damages. Your Insurance Company has adjusters that look out for their best interest and so will you! Having someone on your side that is familiar with both the language of the insurance policy and how those policies are enforced can mean a great deal to how your claim gets settled. Understanding how to handle your claim, proper language to use when communicating with your insurance company, processing the paperwork that is needed will expedite the claims process and get your repairs underway faster. Having a public adjuster who knows the insurance company’s expectations gives you an advantage if your claim is denied. It also gives you a third party resource who can act as a witness in case more aggressive action is required to obtain a recovery. 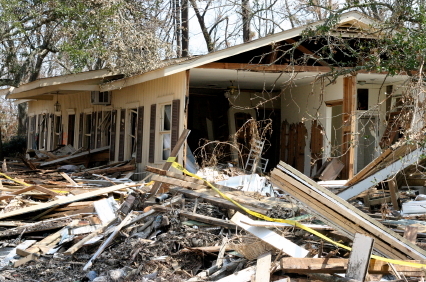 A study conducted in 2010 by OPAGGA (Office of Program and Policy Analysis & Government Accountability) found that property owners in Florida received insurance claim settlements that were 747% larger in catastrophe losses & 574% larger for “non-catastrophe” losses when they hired a public adjuster, as opposed to not hiring a Public Adjuster. Do you Have Water Damage in Your Miami Home or Business? Did you have a Water Damage Claim that was Denied or Settled for Much Less than you Deserved? We recommend that you make sure that you and your family or employees are safe. Then, call the professionals at All Lines Public Adjusters in the Miami, FL area. We will evaluate and determine the extent of your loss and advise you of the process. We can initiate the claim for you as well. Call us at 305 898-3626. If you have experienced any kind of water damage to your home or Miami based business, our licensed professional public adjusters are available 24hrs a day to help. Our public adjusters are among the most knowledgeable, professional and experienced public adjusters in the field of water damage claims. Water damage claims can be very tedious especially in Miami where the weather is so sporadic. That is why so many claims that are settled between the policyholder and their insurance company end up grossly under-paid. Our licensed public adjusters know exactly how to uncover all obvious & hidden water damage claims; all related property damage & related revenue loss. Water damage is one of the most common property damage insurance claims in Florida. Water damage can be a result of a broken or burst pipe, a faulty appliance or even extensive rain that has caused leaks in your roof. Water damage can be extensive. It can ruin your carpets or wood floors, furniture, business equipment and other personal belongings. If you have water damage in your home or business, another concern is mold-especially in Miami Florida. Mold damage can result from any type of water damage to your home. Mold can be a huge health hazard to you and your family. Mold can grow on wallpaper, ceiling tiles, carpets, walls and wood. Mold can trigger allergies, cause headaches, cause dizziness, and trigger asthma attacks or worse. As the policy holder of a residential or commercial property, you are entitled to the maximum policy benefits. Our adjusters are respected specialists and have extensive experience to ensure that the job gets done right the first time around. Regardless if you claim is large or small, our companies team of experts will pay close attention to the details of every claim and work closely with you to provide the evidence that may entitle you to more money for your damages. Want an update on your insurance claim? Simply call the experts at 305-898-3626 and speak with one of our knowledgeable and friendly representatives for an accurate update on where your claim stands. Our adjusters are always directly available to answer any question pertaining to your claim.